I work in an Adventist Mission Secondary School in Hong Kong with over 500 students. 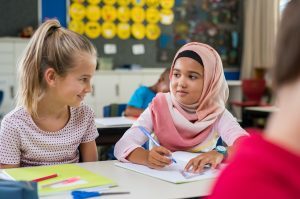 One of the challenges teachers face today is that students come from all walks of life and backgrounds, so embracing diversity is an important consideration in our teaching and assessment. The best methods for assessing diverse learners has become a continuing discussion in the everyday work of our teachers. In the past, assessment practices tended to be summative and focus on “assessment of learning.” In recent years, however, schools have been encouraged to use formative assessments and put more emphasis on “assessment for learning.” Still, summative assessments are sometimes necessary, and it can be difficult to adjust them for a diverse student body. There are two methods we have considered for adjusting summative assessments at my school. First, some schools prepare assessments with multiple versions or multiple levels. This requires more work for teachers. Some schools grade these assessments by using a lower possible highest grade available for the easier version of tests or exams, such as having the highest possible grade for the easier version be a B rather than an A. Some schools do exactly the opposite. They rank their students in two or more lists, then compliment or give prizes to those who achieve high marks regardless of the level of the exam. In this case, fairness is not their main concern; they want students to learn in their own pace and find satisfaction in learning. Second, some schools design one version of assessments, but include questions from all levels of difficulties. Usually this is done in a certain agreed ratio. For instance, 60% of the questions might be easier questions about basic core content, 20% would be moderately difficult, and 20% would be quite difficult. With more differentiation in assessment, teachers can cater for the diverse needs of students. This method is more easily carried out in some subjects than others. For example, it is not an easy task to set exam papers this way for language courses because the difficulty of these exams depends mostly on the reading materials chosen for testing, and it is not easy to choose something suitable for both high achievers and those who are weaker academically. Both of these methods have benefits, but they have downsides as well. Adjusting to the needs of diverse learners is an issue we are still working on resolving, but we know that it is an important issue. As technology continues to develop, it may seem that teachers can be replaced through computers and e-learning. One of the key benefits that we as teachers can bring to education is the ability to adjust for the needs and diversity of our students. We have the opportunity not only to help our students to learn more effectively, but also to make our school a more pleasant place for our students. Born and raised in Hong Kong, Grace did her first teacher training in HK.Then she went to Pacific Union College in California U.S. and obtained her B.A. in English there, and Andrews University for her M.A. in ESL. Coming back to HK after her training, she served as an English teacher, then Vice-principal in Kowloon Sam Yuk Secondary School, an Adventist mission school, for over 10 years before she took up principalship in 1996. She did a MEd in CUHK while working full-time as principal.